A COLLECTION OF MORSE TELEGRAPH AND RADIO RELATED ITEMS FROM THE RADIO STATION OF M6BRN. This lovely little radio using an empty cigar box as the enclosure houses a sprung loaded cats whisker crystal detector, coil and variable conderser. A nice example of a homemade radio circ 1920's. Homemade crystal radio large tuning coil with primary and secondary tappings, missing it's detector but has headphones that are ex military. This radio has been home made in the 1930’s and is still fully functioning. The large coil has been formed on a typical former of those sold in radio component supply stores of the day. It has an arching slider making contact with the bared windings of the cotton sleeved wire used to make the coil and therefore adjusting the tuning. The detector is a Cats Whisker type namely ‘The UNIT’ Galena cats whisker detector. This radio has been tested and has full continuity throughout the coils range. 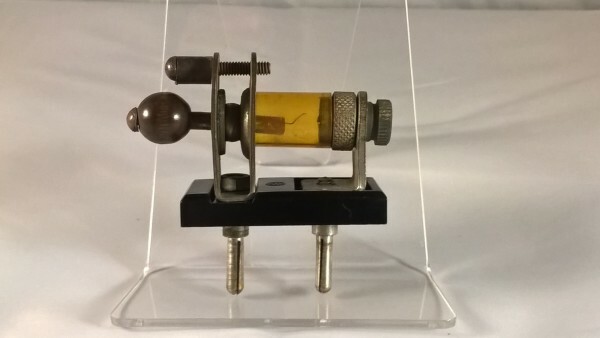 Miniature Home Made Crystal Radio circ 1930. This wonderful miniature set measuring only 3 inches cubed is a fully working radio. The rotary selector switch is wired off tappings on a wound coil that fits snugly inside the case under the top plate. The radio uses a Pirikon Detector which uses two rather rare minerals; Bornite in the fixed cup and Zincite in the movable section. There is no cats whisker in the Perikon Detector, just two minerals that make contact with each other. Research has found the Perikon Detector gives more volume than it's more common counterpart using Galena and the cat whisker. 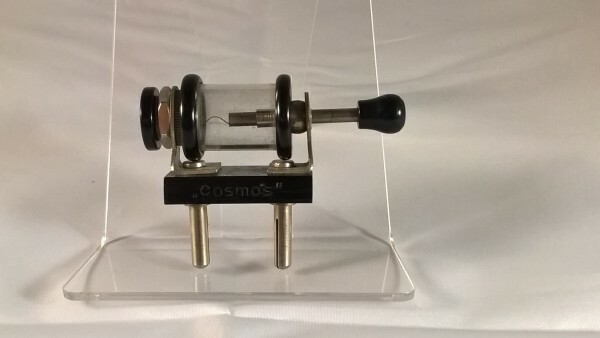 This great little crystal set housed in a bakelite case measuring only 4 inches square and 2 inches high could receive both Medium and long wave broadcasts with the appropiate plug in coils. When it first went on sale it was priced at 3.00 RM (Rentenmark which was the Gold backed currency used in Germany between the wars due to hyperinflation). The above example is in great condition and comes complete with the matching plug in crystal detector. Wilhelm Sihn founded his company in the southern German town of Niefern in 1926 at age 29. Together with five employees he manufactures radio detector receivers, banana plugs and radio parts in rented facilities. By 1932 the company's first factory is built in Niefern. 80 employees manufacture a product line to which insulators and lightning arrester circuit-breakers for long-wire aerials have been added. 1939 saw the start of the antenna production and the first tests of community antennas. The workforce had then grown to 150. 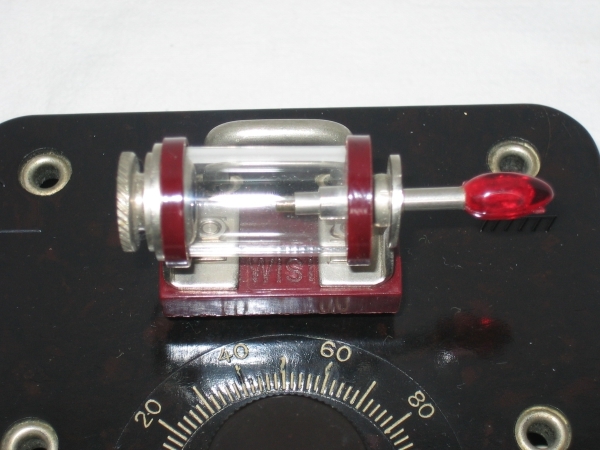 This little crystal set was a variation of the Nr 57 R. Unlike the 57 R which had a plug in cat’s whisker detector, this model had a fixed Germanium Diode and could be tuned to 180 – 550 meters medium wave by means of the variable condenser. 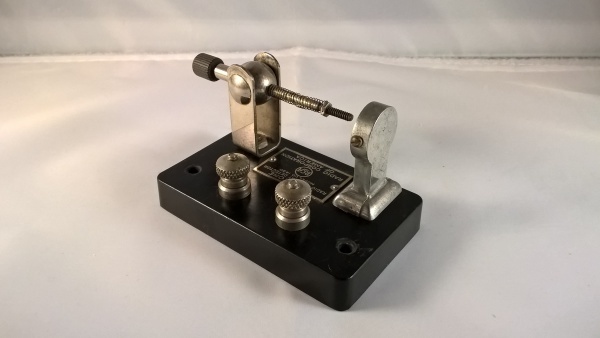 It is identical to the Nr 57 R measuring only 4 inches square and 2 inches high and could also receive long wave broadcasts with the appropriate plug in coils. When it went on sale in 1954 it was priced at 11.50 DM and by 1960 its price had reduced to 10.00 DM probably due to the fact that the early 1960’s was the dawn of the transistor radio and it probably wasn’t as cool to have a radio that wasn’t right up with the times. The above example is in good general condition although there is a small detectable crack in the Bakelite case on the top right corner but doesn’t detract from the function and is not readily detectable. It comes complete with the matching plug in coil shorting bridge marked Nr 65. This nice little crystal set housed in a Bakelite case is presumed to be of German or Austrian origin. It has an internal coil with three tappings wired to three sockets on the left hand edge. The aerial could then be plugged in to give varying wavelength ranges and trimmed with a variable condenser and is complete with a plug in cats whisker detector. The headphones sockets are on the front edge and the earth is pre-wired to a plug but also has a socket to the front of the coil tappings. On the back face is a schematic diagram of the wiring but has no indication of manufacturer. This radio has been home made in the 1940’s and is still fully functioning. It is housed in a beautiful tortoise shell Bakelite sphere. It has a trimming capacitor for tuning and a small coil with two tapping’s going to two possible aerial options and ranges. 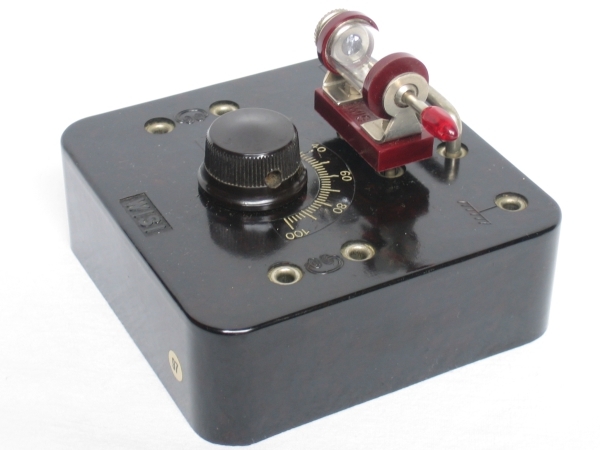 The detector is an inexpensive fixed-germanium diode. The coil is unsupported and seems to hang from the connecting wires which can break off if it is moved violently. Manufactured by Ivory Electric Ltd, these were advertised in the 50s, mainly aimed at boys who wanted a radio but could not afford the batteries, never mind the set. A circular plastic moulding about 4"dia., it is very similar to sets made in the 20s. It says 'with permanent detector' on the box, but it has a “Perikon” type detector. New Luxury Crystal Radio circ 1961 - 65. British Distributing Company (BDC), ‘Bridisco’. Bridisco was an electrical distribution group that contains BDC and Foster Electrical Supplies. Bridisco, established in 1961, employed circa 600 staff. The company, headquartered in north London, is a wholesaler and distributor of a range of electrical goods including appliances, electrical components, security systems, lighting and consumer electronics. It operated through a nationwide network of 30 distribution centres in the UK. The company's own brands include Micromark and Powerlectrik. In 2008, Alan Hudson and Roy Bailey of Ernst & Young LLP were appointed joint administrators of Bridisco. Alan Hudson commented: “Bridisco Limited has been experiencing trading difficulties and liquidity constraints in recent months which, combined with losing credit insurance, unfortunately resulted in the business being unable to trade outside of administration. The administrators tried to continue to trade the business with a view to selling the company as a going concern but it was voluntarily wound up at the end of 2013. This example is in 'as new' condition, complete with instructions and box. Bakelite Crystal Set. Unknown manufacturer. Circ 1935. This nice little crystal set housed in a Bakelite case is presumed to be of British origin but has no manufacturer markings. It has a Cat’s Whisker Detector which on this example is missing one of the brass end cups and the glass. The aerial would be attached to the top left terminal marked ‘A’ and trimmed with a small variable condenser. The earth wire would in turn be attached to the top right terminal marked ‘E’. The headphones would be connected to the two bottom terminals. This is the GECoPHONE Junior Crystal Set BC1700. Built by GEC (UK) in 1925, this simple crystal set is housed in a polished mahogany case. Connection points for the aerial, earth and headphones are provided, and the controls comprise a tuning knob and a lever to adjust the detector. The set would have cost 15s 0d in 1925 with the 1600m Loading Coil costing an extra 7s 6d. The aerial (antenna) is connected to either terminal 'A' or terminal 'B' dependent upon its length. Long aerials were connected to 'A' and medium length aerials to 'B'. A long aerial has significantly more capacitance (to earth) than a medium length aerial but the tuning control needs to have roughly the same tuning range for either. Taking the long aerial connection to a tap some way down the tuning inductor reduces its loading on the aerial tuning circuit to roughly the same as for a medium length aerial connected to 'B'. Hence the tuning range remains roughly constant. For MW operation a shorting link is fitted to the 'Loading Coil' terminals. The detector is of the galena/cat's whisker type. The galena crystal is held in the screw-cup to the left and the cat's whisker (a curly piece of wire) is held in a sort of pin-chuck to the right. In operation, the handle attached to the cat's whisker is carefully slid in and out and/or rotated so that the cat's whisker drags across the surface of the crystal. The crystal is covered in many contact sites that will allow rectification to take place. With careful adjustment the cat's whisker will fall upon one of these sites and a when this happens a detector is formed. The audio output from the detector is connected to the headphones via terminals marked 'T' ('T' for 'telephones' as they were know then). Two sets of headphones can be connected in series by making use of a third, unmarked, terminal between the two 'T' terminals. There is no RF decoupling capacitor connected across the audio output as was often seen on other crystal sets. No doubt the designer felt that the headphones themselves have sufficient capacitance for the task. 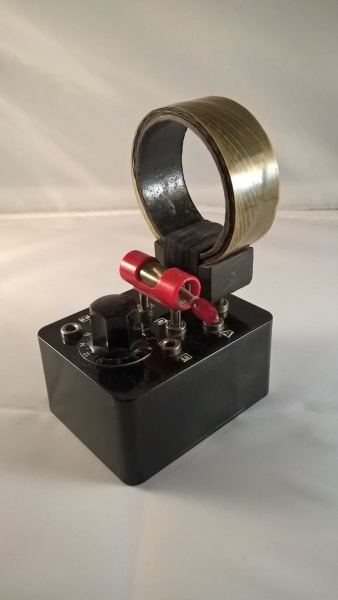 For reception of the 15kW 5XX station on 1600 metres (broadcast from the Marconi works in Chelmsford, England) the 1600m Loading Coil could be plugged in. British Crystal Radio circ 1949 - 54. 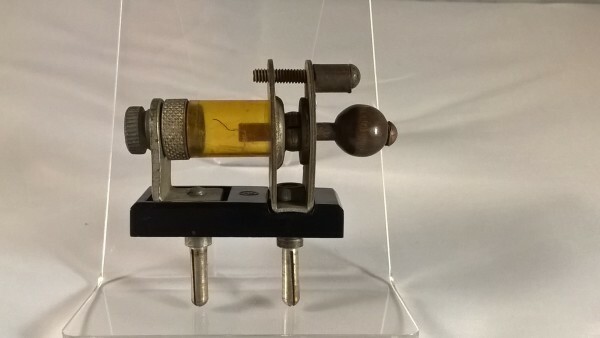 This Bakelite crystal radio used a permanent Pirikon Detector, which utilised two rather rare minerals; Bornite in the fixed cup and Zincite in the movable section all housed in a screw together housing. 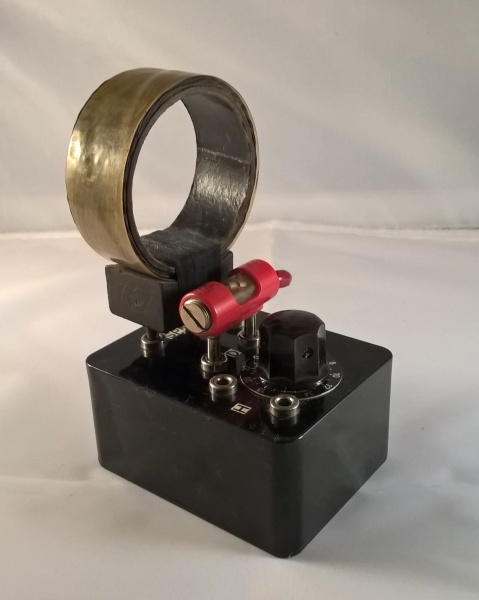 It has a square wound coil formed round a timber former and an arcing brass tuning slider. On the upper face are 2 terminals, left side top, marked “A1” (Black) and “A2” (Red) for the aerial connections, 1 terminal, right side top, marked “E” (Red) for the earth and below that is one marked “C” (Black). At the bottom edge, below the tuning knob, are 2 terminals marked “PH” for the headphones. Inside there are 2 fixed capacitors, one between the two aerial terminals and another between the earth terminal and the terminal marked “C”. This radio was manufactured by Highstone Utilities of 58 New Wanstead. London. E11. They were advertising this in the Meccano Magazine dated December 1949 as a real radio receiver and priced at 9/6 with postage of 6d, a replaceable permanent detector was 2/-. Also advertised was a De Luxe Receiver in a polished cabinet priced at 18/6 with postage of 1/- but by August 1954 this price had risen to 12/6 although the price of the detector and postage remained the same and the De Luxe model had been withdrawn, maybe too expensive or it had been superseded by newer technology. Highstone Utilities were clearly active during this period but I have not discovered any activity after this date. 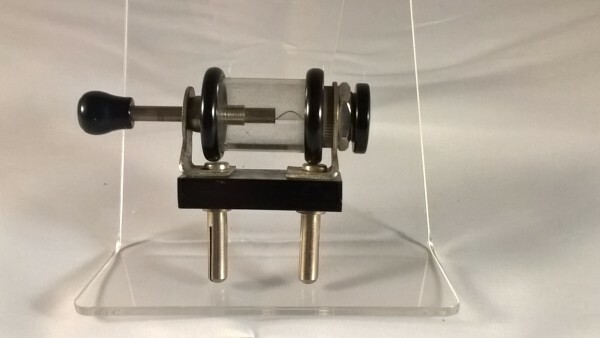 This is a rare, well made crystal radio which was manufactured and sold by “Electradix” between 1928 and 1940. It is in great original condition although the lacquered coating of the top plate is peeling. It is the first radio that I have come across where the tuning dial is marked in Braille so was obviously made for the blind. 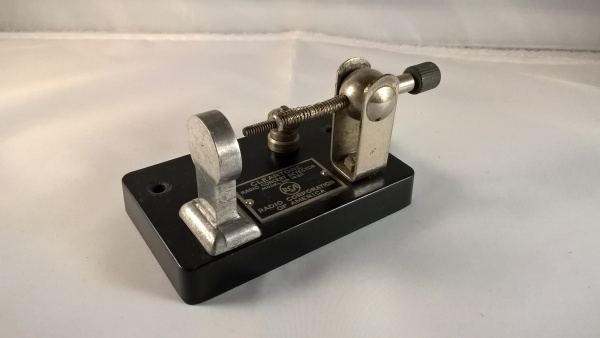 It has a tapped loading coil of cotton covered wire with a tapping part way down to allow for a shorter antenna length and two antenna terminals on the top plate. All of the terminals are coloured red and black with the caps captivated to prevent them being removed and lost. 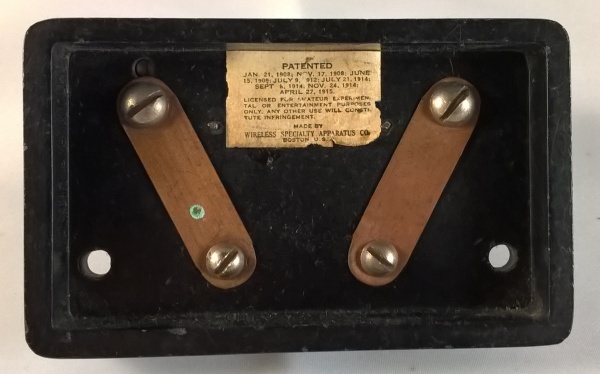 The variable and fixed capacitors are both stamped “Ormond” but there is no marking’s on the sprung loaded Cats Whisker Detector which is housed inside the case with only the adjusting rod protruding through the plate allowing it to be “tickled”. On the underside of the comb jointed timber case is the marking S7020 in 3 positions from corner to corner, this may be a serial number or model number but to date I have not seen another example. 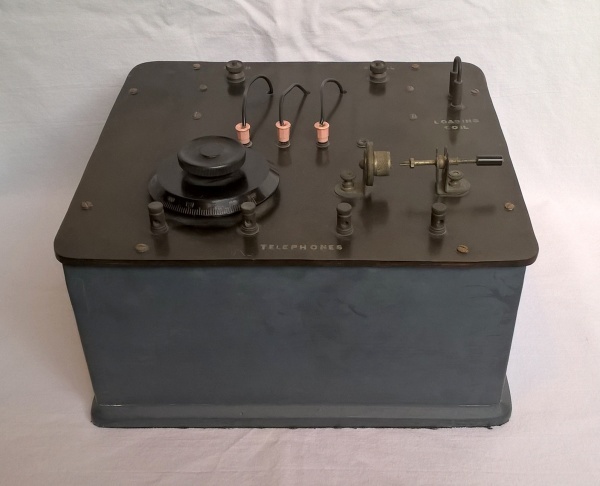 This radio was a product sold by Leslie Dixon & Co based at Electradix House, 218 Upper Thames Street, London E.C.4 and was owned by Millar L. Dixon, M.E. Dixon and H. Leslie Dixon. They used several names on their ‘own brand’ items such as Dix, Electradix, Dixon, Onemeter and Mipanta but also sold the electrical products of many named manufacturers. This French boxed crystal set is housed in a timber box with lid covered with a red simulated snake skin covering. It has one variable trimming condenser, a plug in cat’s whisker detector and two antenna terminals allowing variation in wavelengths. I have not been able to find out anything about this set so any further information on this radio would be greatly received. This French boxed crystal set is housed in a light timber box with lid. It is marked “Radio Gambetta” F. Fouche’ of Libourne and Tel 598. It has one variable trimming condenser, a fixed cat’s whisker detector and two antenna terminals allowing variation in wavelengths. Inside the lid is a set of instructions for how to operate the radio successfully. I have not been able to find out anything about the manufacturer so any further information on this radio would be greatly received. This nice little French crystal set, housed in a Bakelite case, is the model ‘Le Poste du Professeur Jacmart’ and was manufactured by Jacques Mendel under the mark of Jackson Radio which were located at 164 Route de Montrouge, Malakoff, Paris. France. between 1929 and 1935. It has two variable trimming condensers, a fixed cat’s whisker detector and a 2 coil terminals where various coils can be wired, in the images above these are shorted together. It measures 183mm x 132mm x 70mm and was advertised in 1933 in a catalogue for ARC Radio at a price of 100 FRF. This information was taken from the Radio Museum website. There is old repaired damage to the rear of the casing. Thank you to Chris Morgan in Australia who kindly contacted me with the identification of this set. This radio has been home made from either discarded radio or kit parts from the 1940’s. It is all mounted on a varnished timber base. It has a cat’s whisker detector and a slide tuning antenna coil, it has two headphone clip terminals on the front of the base with the antenna and earth terminal clips on either end of the coil. 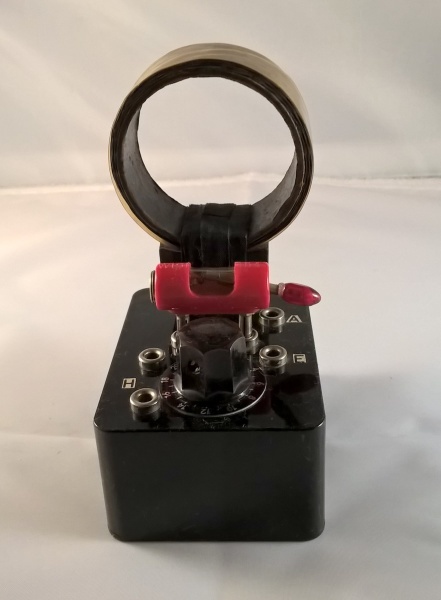 This German homemade crystal radio is well made in a black enclosure. Inside is a price label of 2.25 DM indicating the price of the enclosure and dating it to after 1948 and before 2002. 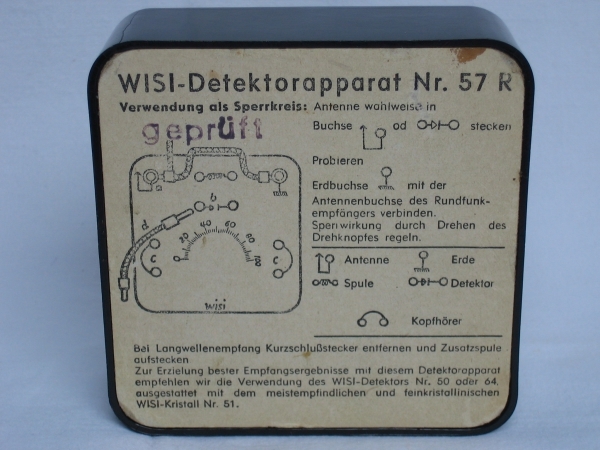 The detector used is a plug in WISI 64 which was first produce around 1936 at a retail cost of 0.50 RM. And there is a plug in antenna tuning coil marked 75. This German Detektor was manufactured and advertised between 1932 and 1939. It appears to have been manufactured and sold under various brands like Roka and Dema but research points to Robert Karst of Berlin, producing the Roka brand was the most likely manufacturer and who also produced and supplied other retailers who would sell them under their own badge. 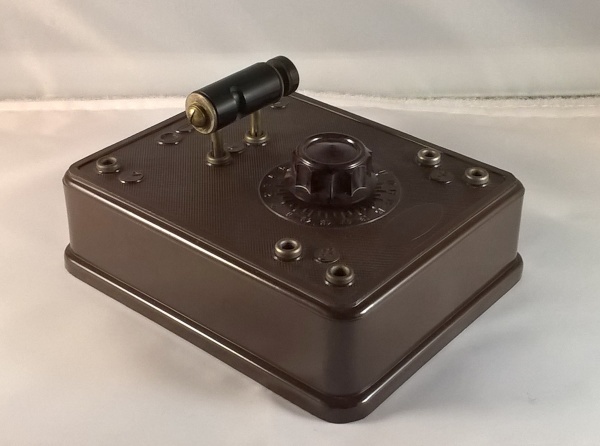 The Bakelite case measures 140mm x 110mm x 40mm and this example is fitted with a “Telux” Detector. This radio was purchased from Erwin in Vienna, Austria in 2019. The “Telux” is a double crystal detector, in which instead of the usual combination of a crystal coil spring and 2 crystals. As is well known, a more or less rapid failure occurs in ordinary detectors due to oxidation of the metal tip of the cats whisker, which is prevented in this construction. Price when first offered for sale was 3.00 ATS with the price of replacement crystal at ATS 0.80. The “Telux” brand was manufactured by Erema, Elektroges. Czasch u. Brüch; Vienna. Austria. 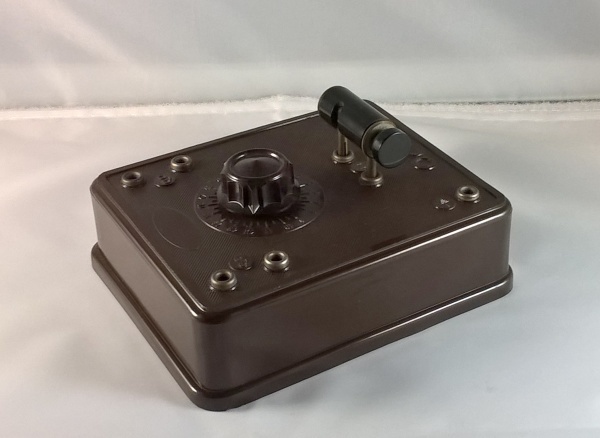 This radio has been home made in the 1940’s and is housed in quite a large enclosure which includes a tapped tuning coil with plugged tapping lines allowing various available tuning setups. It has a cat’s whisker detector, a large rotary air condenser and a socket for plug in coils to also enhance the available receiving frequencies. It can accommodate two sets of headphones and is in perfect working condition. A cat's-whisker detector (sometimes called a crystal detector) is an antique electronic component consisting of a thin wire that lightly touches a crystal of semiconducting mineral (usually galena) to make a crude point-contact rectifier. Phosphor bronze wire of about 30 gauge was commonly used because it had the optimal amount of springiness. It was mounted on an adjustable arm with an insulated handle so that the entire exposed surface of the crystal could be probed from many directions to find the most sensitive spot. Cat's whiskers in simple detectors were straight or curved, but most professional cat's whiskers had a coiled section in the middle that served as a spring. The crystal required just the right gentle pressure by the wire; too much pressure caused the device to conduct in both directions. Precision detectors often used a metal needle instead of a cat's whisker, mounted on a thumbscrew-operated leaf spring to adjust the pressure applied. 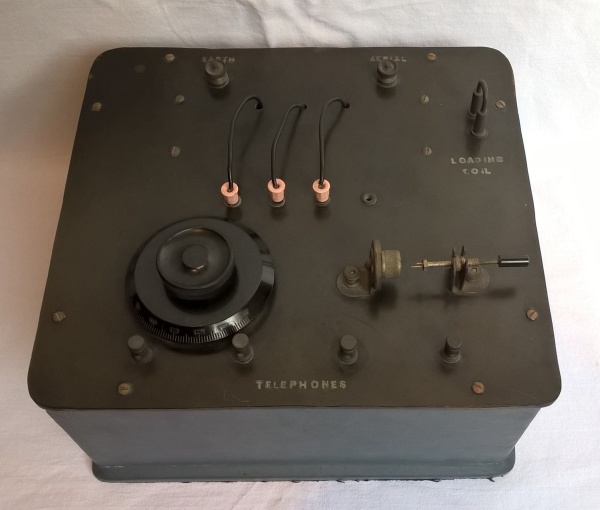 Developed around 1904 by early radio researchers Henry H. C. Dunwoody, G. W. Pickard and others, this device was used as the detector in early crystal radios, from the early twentieth century through World War II, and gave this type of radio receiver its name. Crystal radios were the most popular type of radio until the mid 1920s. 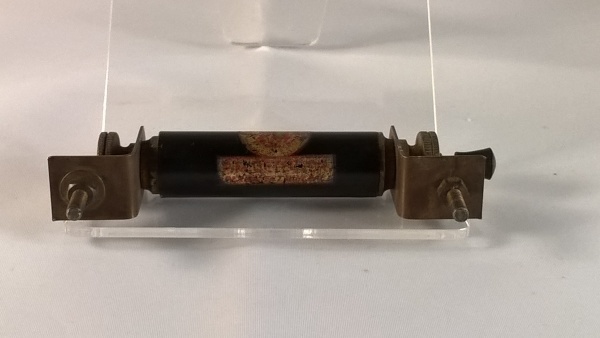 The cat's whisker detector was the first type of semiconductor diode, and in fact, one of the first semiconductor electronic devices (after photoconductors). Cat's whisker detectors are obsolete and are now only used in antique or antique-reproduction radios, and for educational purposes. The tip of the wire contacting the surface of the crystal formed a crude but unstable point-contact metal–semiconductor junction, forming a Schottky barrier diode. This junction conducts electric current in only one direction and resists current flowing in the other direction. In a crystal radio, its function was to rectify the radio signal, converting it from alternating current to a pulsing direct current, to extract the audio signal (modulation) from the radio frequency carrier wave. The metal whisker is the anode, and the crystal is the cathode; current flows from the whisker into the crystal but not in the other direction. Historically, many other minerals and compounds besides galena were used for the crystal, the most important being iron pyrite ("fool's gold", iron disulfide, FeS2), silicon, molybdenite (MoS2), and silicon carbide (carborundum, SiC). Some were used with gold or graphite cat's whiskers. Another type had a crystal-to-crystal junction instead of a cat's whisker, with two crystals mounted facing each other. One crystal was moved forward on an adjustable mount until the crystal faces touched. The most common of these was a zincite-bornite (ZnO-Cu5FeS4) junction trade-named Perikon, but zincite-chalcopyrite, silicon-arsenic and silicon-antimony junctions were also used. A Pirikon Detector which uses two rather rare minerals; Bornite in the fixed cup and Zincite in the movable section. There is no cats whisker in the Perikon Detector, just two minerals that make contact with each other. Research has found the Perikon Detector gives more volume than it's more common counterpart using Galena and the cat whisker. Crystal Detector by Ward & Goldstone Ltd 1923. This detector was advertised in a page of "Popular Wireless Weekly" dated April 21 1923. It was on an advert by Ward & Goldstone Ltd. of Pendleton. 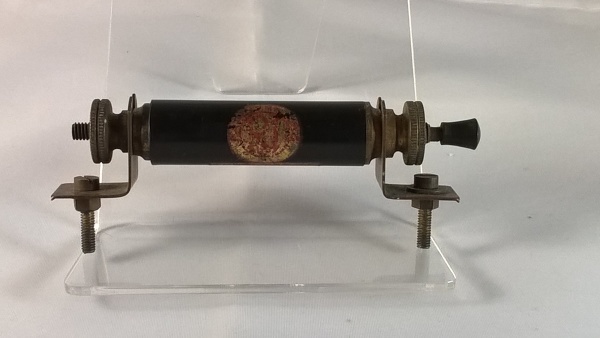 Manchester and described as "Crystal Detector mounted on Ebonite base. Cost 3/-". 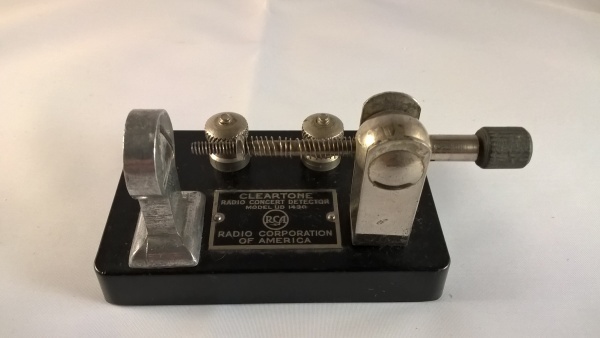 In May of 1923 RCA introduced two Cleartone detectors manufactured by Wireless Speciality Apparatus that were less expensive than the DB detector manufactured by Westinghouse. The Cleartone Model UD-1430 detector was an open type retailing at $1.60 while the UD-1432 was enclosed in a protective glass cylinder and retailed for $2.30. These detectors were all discontinued by the end of the 1923 season, marking the end of the crystal set era for RCA broadcast receivers. Wireless Speciality Apparatus Company was one of the companies that organized, along with General Electric and Westinghouse, to form the Radio Corporation of America RCA in 1919. WSAC was one of the manufacturing divisions of RCA and sold under the agreement with RCA. Looking at the label on the underside, this was first patented in 1908 with various upgrades up until 1915 these patents must be with wireless Speciality Apparatus while they were still an independent company. This permanent mineral detector by Radio Instruments Ltd was introduced in 1925 with an original cost of 6 shillings. It has a cylindrical body with brass end fittings. There is no cat’s whisker instead an adjustable arm alters the movement of one mineral against another. It was marketed as the alternative to glass enclosed cat’s whisker detectors and “the discovery of 1925″. The first advert found for this detector is in the June 1925 edition of The Wireless Constructor magazine (page 787). A later advert was found in the Popular Wireless and Wireless Review magazine dated Oct 2nd 1926 (back cover). The above information was extracted from the Valve Radio website www.valve-radio.co.uk and of which has many examples of early radio components. Minor X Model Stentorian Speaker by Whiteley Electrical Radio Company Ltd. This extension speaker manufactured by Whiteley Electrical Radio Company Ltd of Mansfield, Nottinghamshire was made between 1938 and 1947. It is a Minor X Model Stentorian and is a smaller and more basic loudspeaker than the Stentorian Baby. 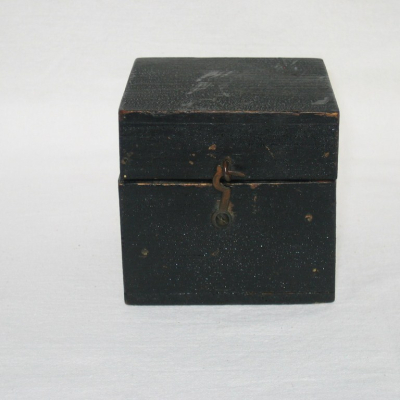 It has a 5 inch speaker housed in a 22.5cm wide by 23.5cm high brown painted wooden case. On the front face is a 5 position switched volume control conected directly across the speaker voice coil is a tapped wire wound resistor of 16.3, 12.7, 6.8, 2.5, 1.2 ohms. 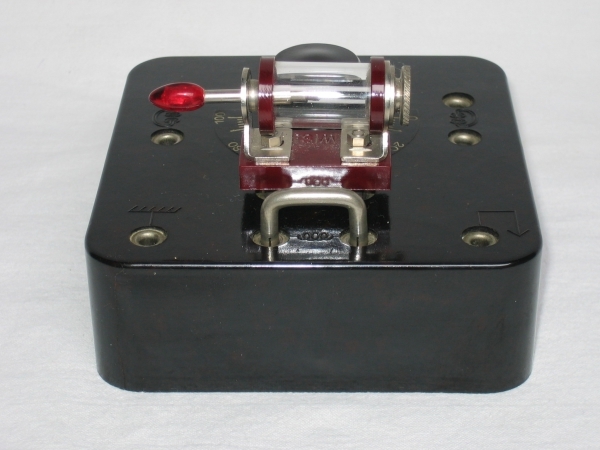 This coil operated switch was manufactured by H.B.H. Products around 1930 and carries the Pat. No. 256363. It operates by way of a remote power button which takes a current from the L.T. batteries, operating an internal coil which switches on the L.T. power to the radio set. As can be seen from the original label on the back, it was guaranteed for 1 year.